Outback School of the Arts is located in the outback mining town of Mount Isa and services the North West district. We offer classes in music, speech & drama and art for primary, secondary and adult students. To find a full listing of our classes click here. Check out our new Kids Creative Parties! 1/2 hour private lessons for primary and secondary students. 1/2 hour group lessons for primary and secondary students. Groups are for 3 students. Ukulele Group for primary and secondary students. Ukuleles provided or bring your own. 30 min group (6 students) lessons for primary and secondary students. Larger groups may be available. Beginner art: 1.5 hour group classes for primary and secondary students. 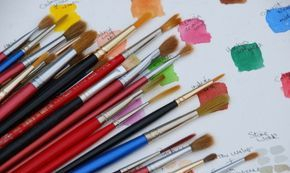 Adult art: 2 hour group classes for adults. These are usually presented in short course formats with a different focus each course.